I just had a nice long vacation. Today is the last day. It’s a bit sad, but I have the realization to hang on to that I’ll get another week off at the end of December. As far as vacations go, this one was extremely productive. At the beginning of the week off I took loads of stuff to goodwill and half price books. On Saturday, Mr. Ink and I took two truck loads of crap that cannot be rehomed to the dump. The creepy basement has far less stuff in it, which makes organizing what is still there far easier. I did the organizing today. I’ve still got a load of stuff to take to goodwill. Just one more load for now. But, what I am hoping is that my motivation does not wane, and I continue to purge and organize upstairs, starting with the kitchen. I think it can be done. I’ve also had time to do fun stuff. I spent time with Miss Bug, hung out with Mr. Ink, and due to the extremely balmy weather yesterday, got to ride mountain bikes. I even had an opportunity to try out a fat bike, something I’ve hoped to try for a long while now. As my regular readers are probably well aware, I’ve also got the bulk of the Christmas knitting done, and wrapped. Can you believe it? It feels great to be this ahead of schedule, though I suspect what with happen with being ahead of schedule is that I’ll add to the list rather than just be done with it. Today I am trying to knock out the 5 itty bitty socks that need to be knit for Bug’s teachers. I have 4 done, I will finish a 5th, and then I need to do some for coworkers. There’s also been some spinning, but not much. Last Saturday I went to our local guild show and picked up some lovely things. 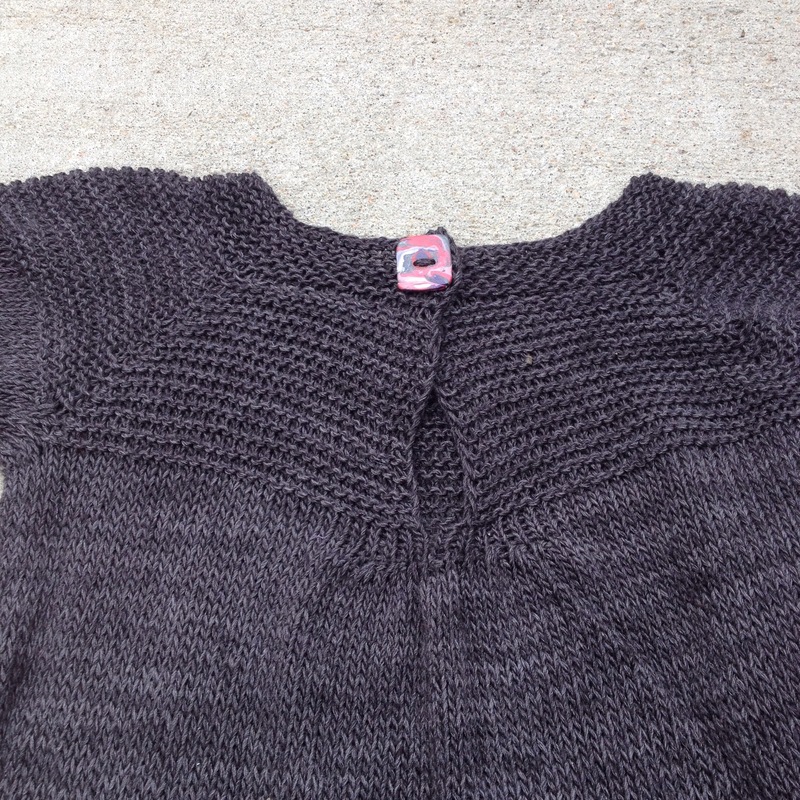 Perhaps the most lovely and decadent item I picked up was a package of rolags. I love love love spinning from rolags, and yellow is a color that always calls to me. I am spinning them on a support spindle, and these are the ones I may leave as singles and just immediately knit them off the spindle. I’ve never done such a thing before, but I think it could be an interesting experiment. Hopefully tomorrow I’ll have some itty bitty socks to show off! If I am not too bitter about going back to work….. 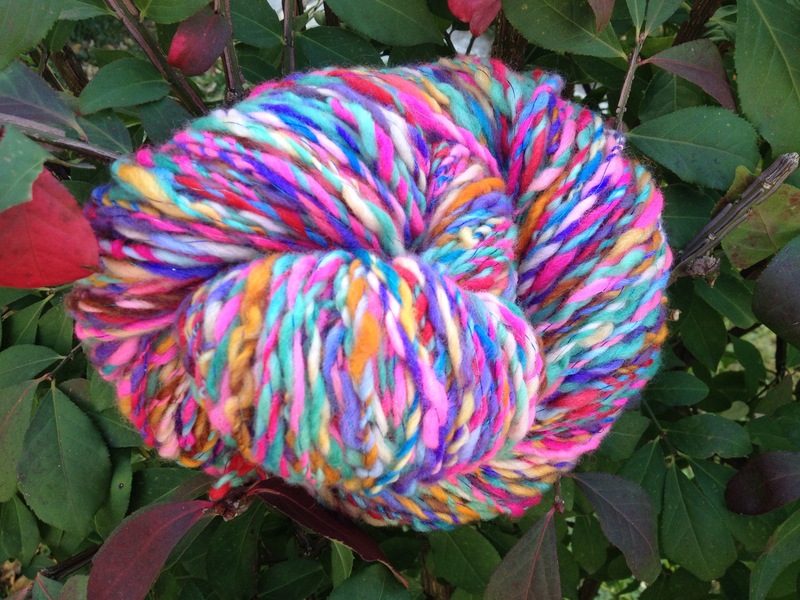 I made crazy yarn, and didn’t end up wanting to knit with it. 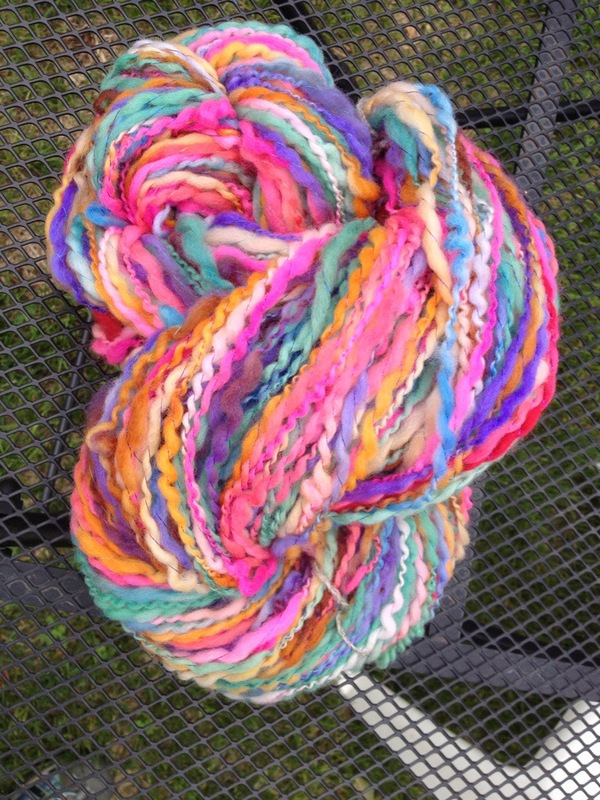 So, I took that yarn and made it crazier, by plying it together. And then I did want to knit with it. But, I couldn’t imagine ever wearing the colors. So, I decided that it goes nicely with the Christmas theme, I’d make a cowl for Bug, and she could wear the crazy colors. 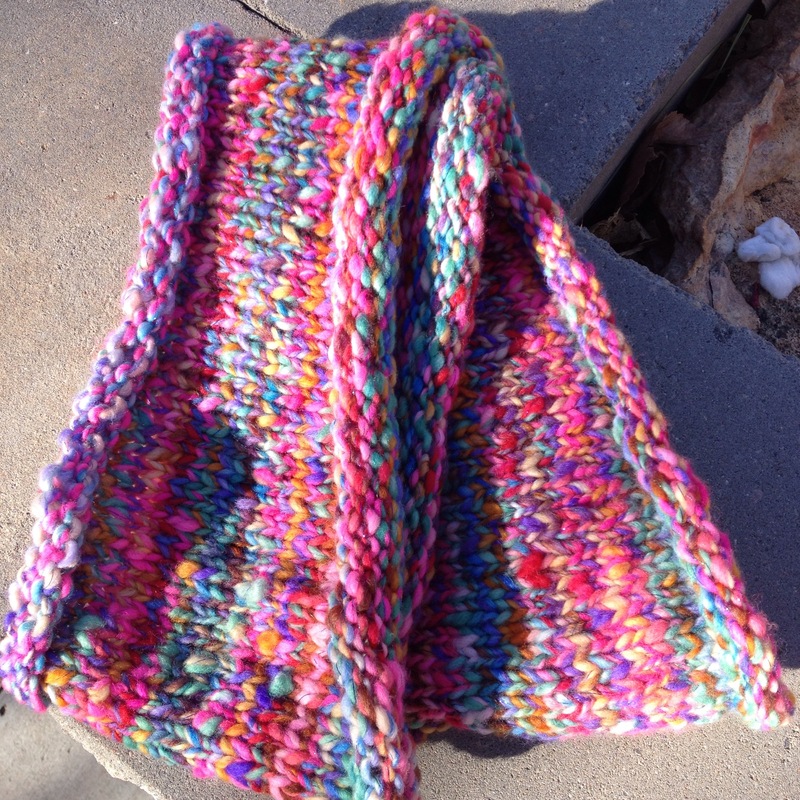 It’s just a simple stockinette stitch cowl, but I think she’ll enjoy it. Don’t you love it when your vision of a project turns out to be less fantastic than the actual project? I have had some of Marja’s singles in my stash, the handspun being of the inglenook variety. I think she was nervous about them being singles, but I was not, and the yarn was so beautiful that it wanted to be knit. 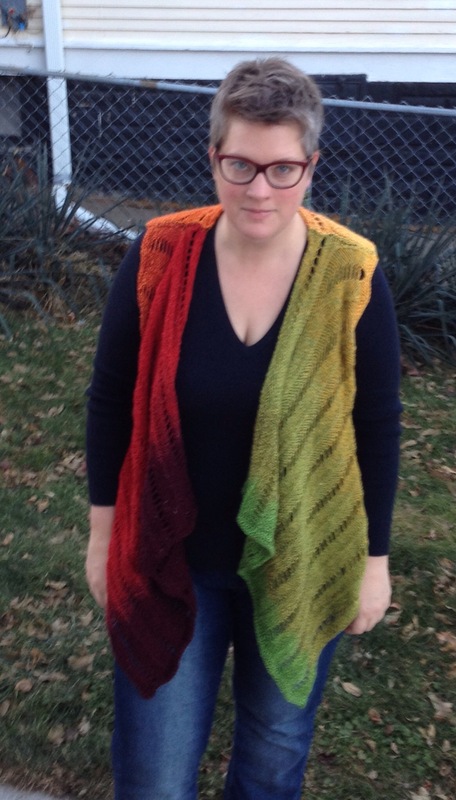 I searched around for a bit for a pattern I thought would showcase the yarn itself, and landed on the So I Gather shawl. It’s a ruched pattern, and it seems quite wearable, so I gave it a try. I worked on it most of the day yesterday, and I love how it is turning out. The singles look good, energetic but not too crazy. The large needles with the thin yarn give it all a light and airy quality. This one is going to be crazy warm once it’s complete. As with Inglenook handspuns, it is even more rich and luscious in person than my picture shows. But, I think you can see the depth of color pretty well. I love this shawl so much so far that I intend to knit another out of my own handspun singles, which I am creating right now. I may even just knit right off the spindle for a new and interesting experiment. 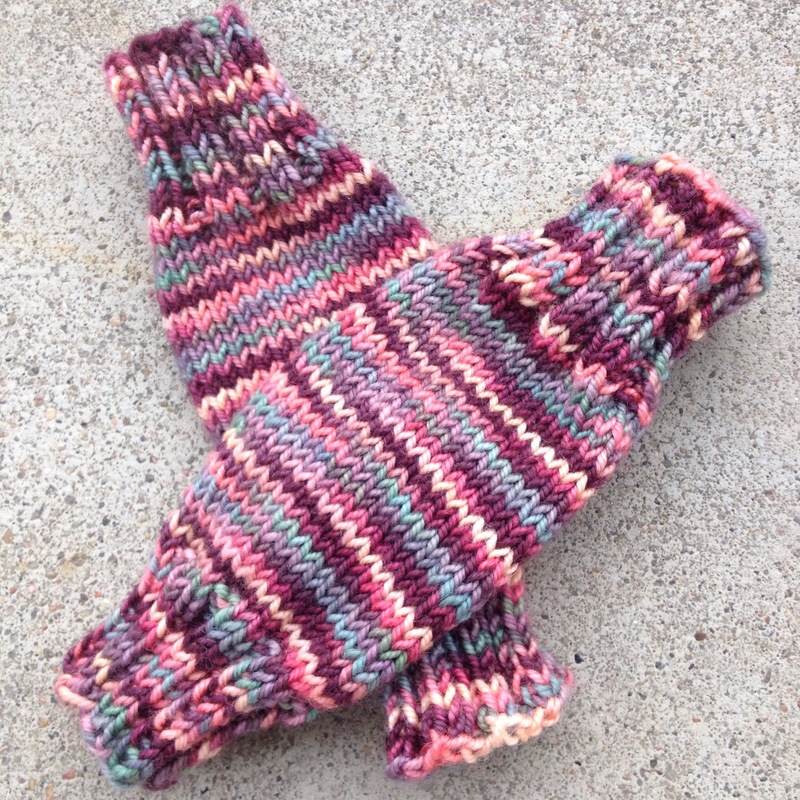 I’ve got two more finished objects for Bug’s handknit Christmas, and each of them are extra special. In the sense that besides being hand knit, they’ve got an extra touch from someone else special in Bug’s life. 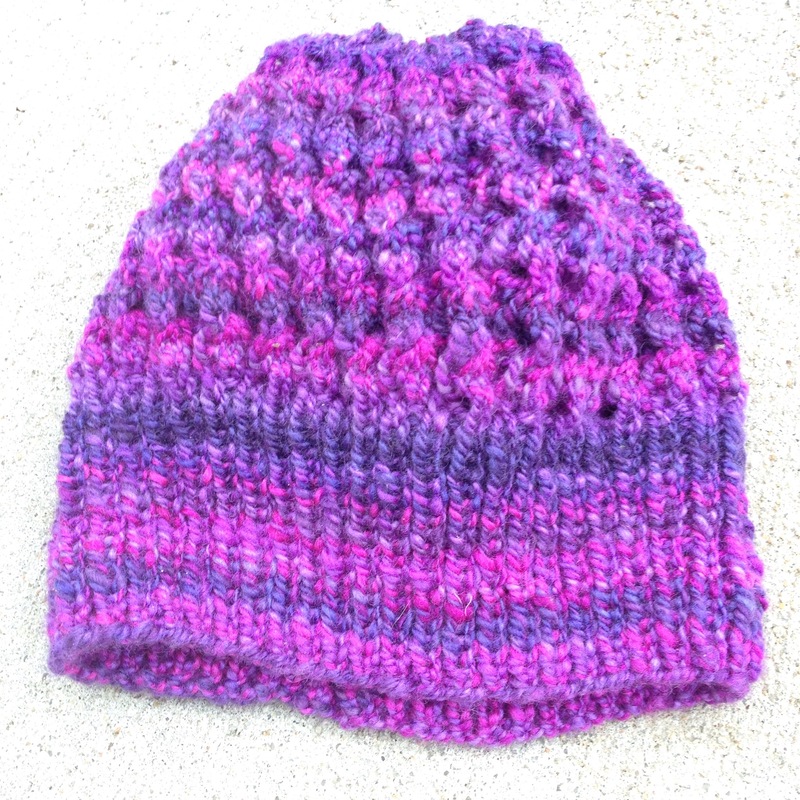 The first is her shroom hat, downsized to accommodate thinner yarn than the pattern calls for. Its extra special touch is the yarn itself, which was spun by Marja. It’s a wonderful purple and pink and blue toned yarn, and that’s a color combo Miss Bug truly appreciates. The second item is her tunic. I’ve been working on this for some time now, and it turned out fantastic. 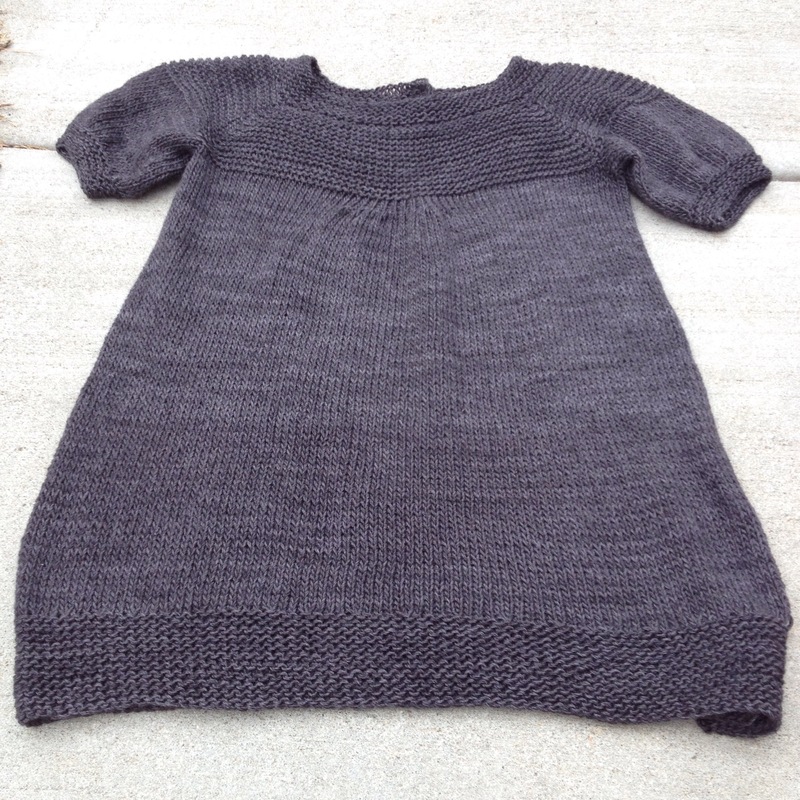 The pattern is Bulle, and I knit the largest size, and then added extra length since Miss Bug is quite tall. In addition to that, I messed up the yoke itself, so it doesn’t quite look like it is supposed to, and I was too lazy to do the pockets. 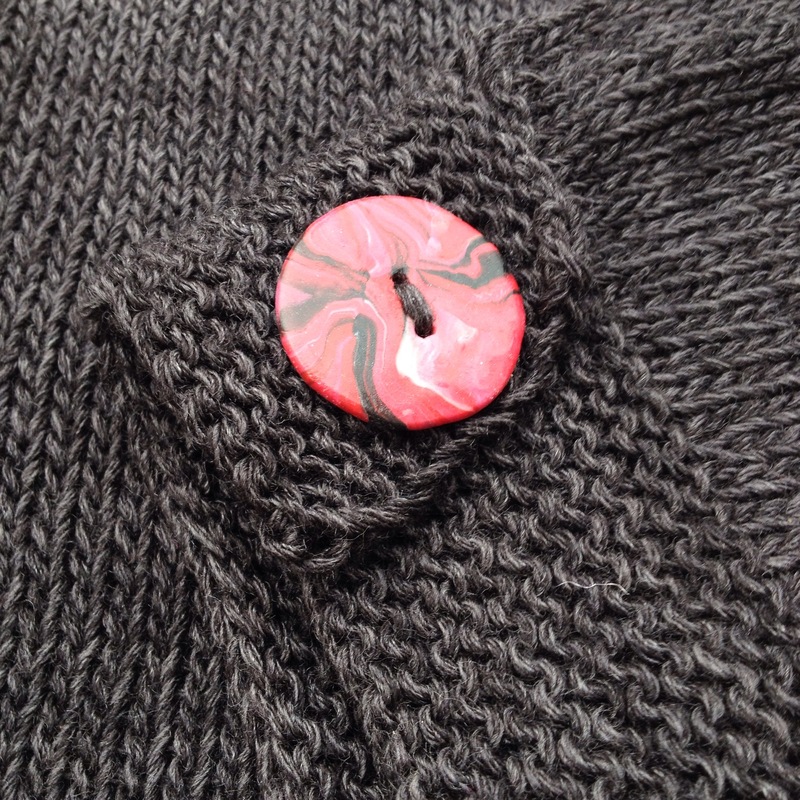 Its extra special touch is the buttons. 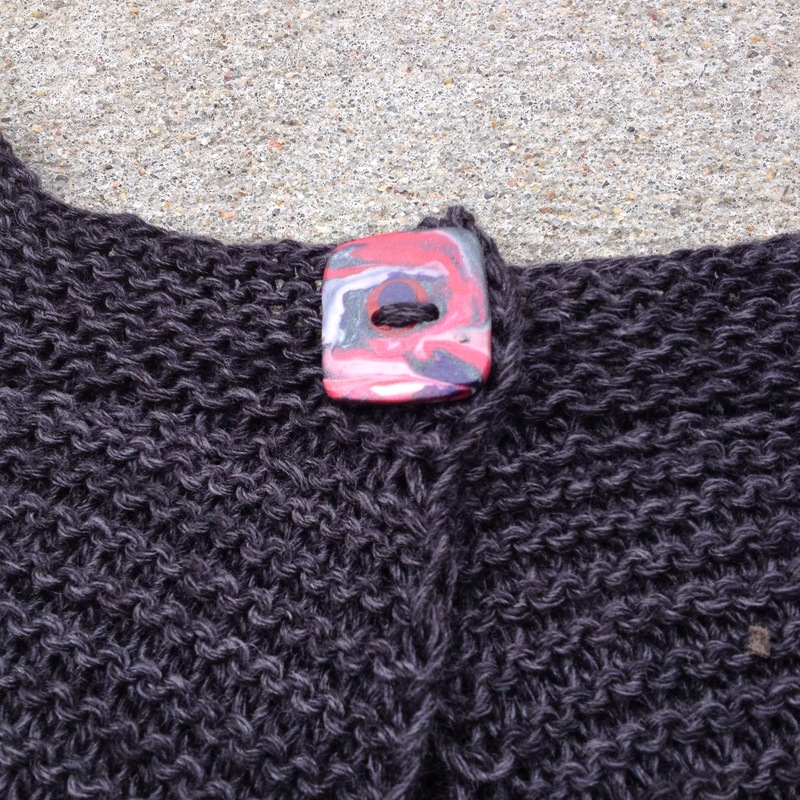 They’ve been hanging around in my button stash for a few years now, because they were made by my mother, and I wanted an extra special project to put them on. This was the project. And now, I get to wrap a few more gifts to set under the tree. Happy Thanksgiving everyone, I do hope you are enjoying it. I am back at the christmas ornaments, and having a great time with them. First up, one I did for Bug for a stocking stuffer. She’s been begging for this one, and I didn’t really want to make it. But, since it’s her year of handknits, I figured it’s only appropriate she get it in her stocking. This is a new color combo, it’s navy and grey. I like it, and hope for more of this combo, perhaps more navy with a grey design. And, next up, one I’ve been thinking about making for years. To my knowledge, this is the only 3 color Christmas ornament in the entire book. 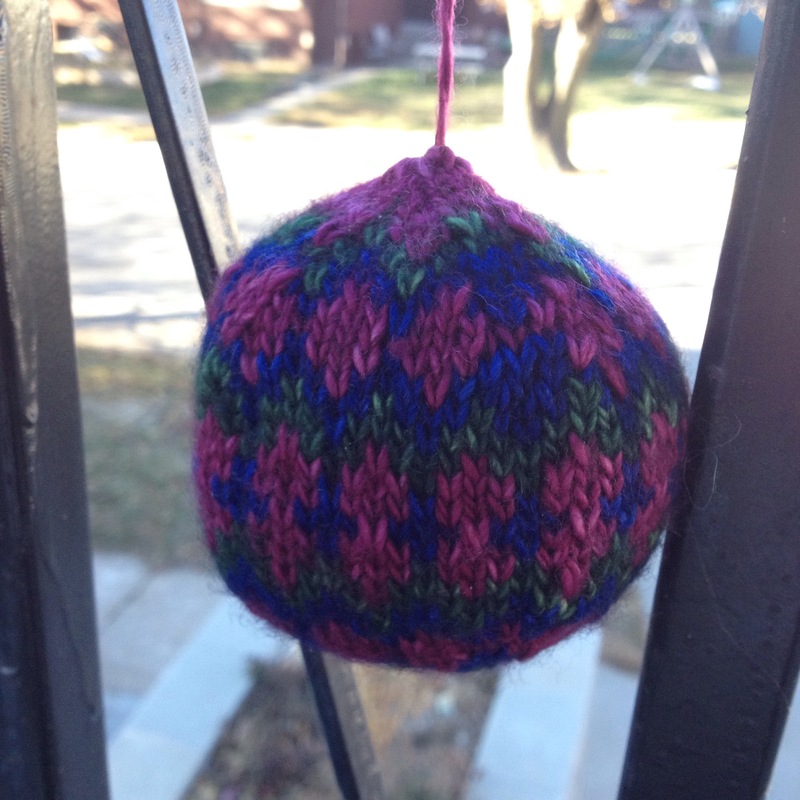 I decided to use the yarn leftover from my color affection shawl, so I ended up with a lovely jewel toned ornament. I had to hold the yarn double for this, which was complicated and very tight stitches, but I think the end result is quite beautiful. Though I can see it needs some additional squishing to get it more round. I am again out of stuffing, so I am going to need to slow down on the ornaments and do more flick carding. In the meantime, I am hard at work finishing Bug’s Christmas tunic, and it’s almost there! I am excited to show it off as well, even though I’ll be stuck waiting for a modeled photo until after Christmas. So, awhile back I found a vest pattern at a new local yarn shop. I purchased the pattern, and was tempted to purchase the yarn. 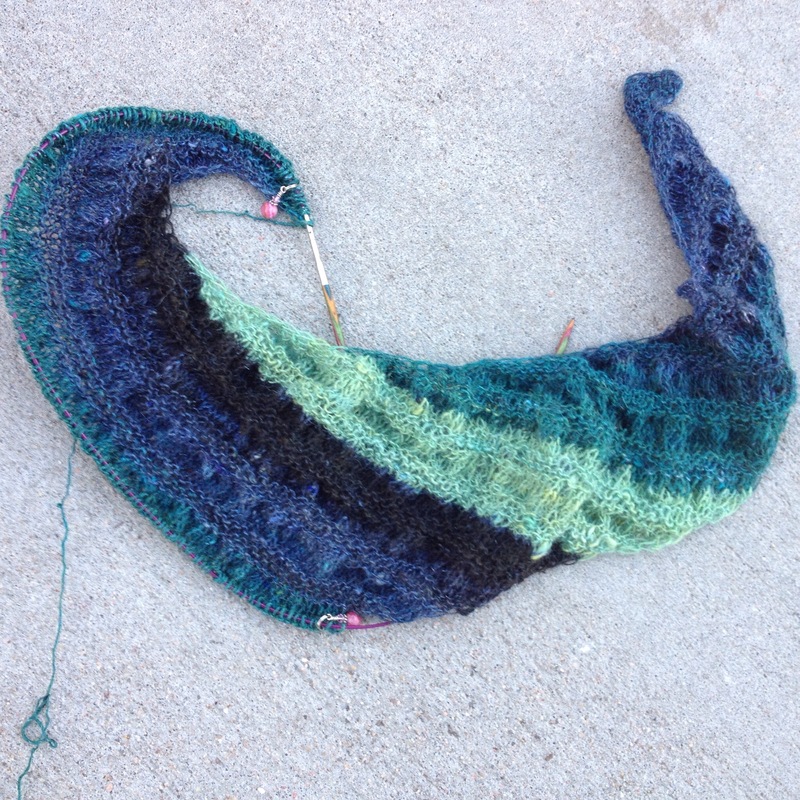 Then, I remembered that I had two loop bumps that I could spin for a nice long gradient, and I’d probably have enough for the vest. 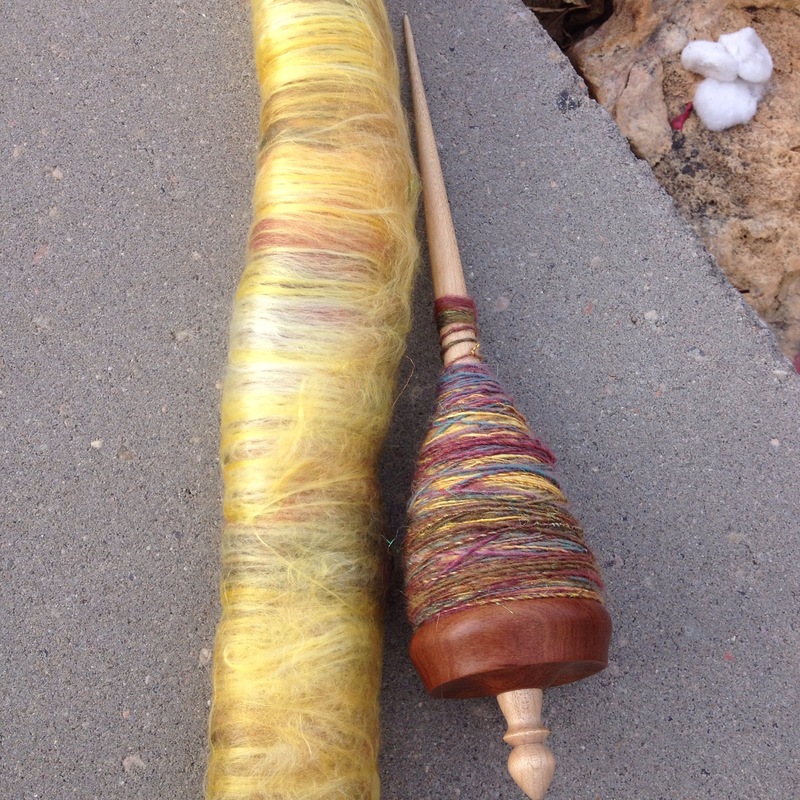 So, I embarked on the long journey of spinning for a finished object. 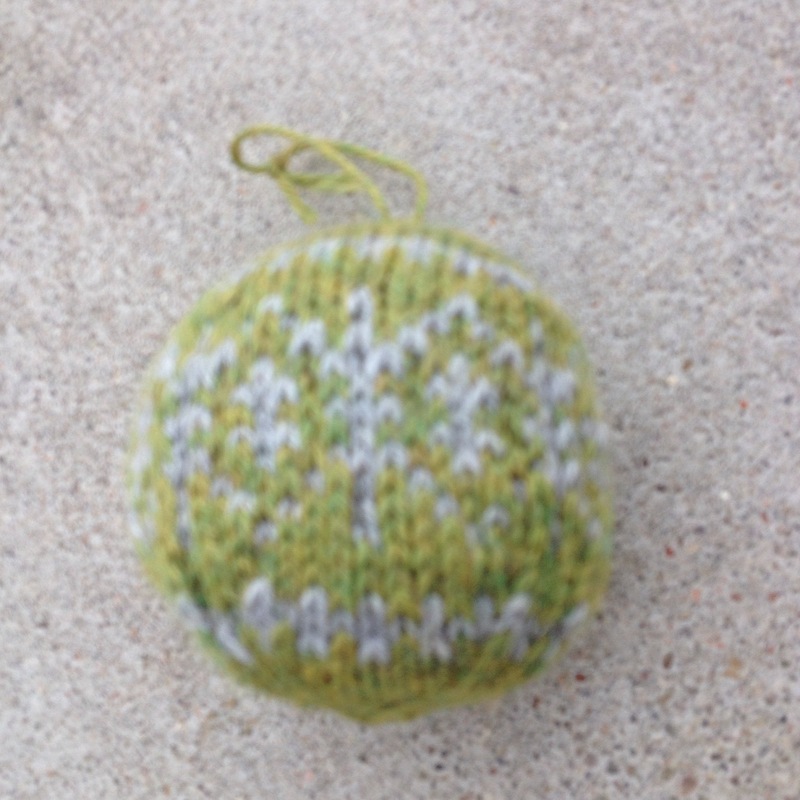 I was concerned about the yardage once I was done, especially since I added an additional repeat for my height. But, in the end, I had a bit left over, while still going through the entire gradient. I was quite pleased. It fits nicely and it’s interesting and cute. The pictures don’t really show the sparkle, but it’s in there. I love the way it drapes, and it’s quite comfortable to wear, so I will call it a win. It’s been busy, friends. Very busy. This weekend I went to the local weaver’s and spinner’s guild show, then to our local Cranksgiving. This is a bike race/scavenger hunt which brings in food for the local food bank. Each rider got a list of 10 items the food bank needs this time of year, and then they go out and purchase each item from different stores. I volunteered this year which was great fun in and of itself. There was quite a bit of downtime, so I knit and hung out with friends while waiting for the participants to return. I took this week off work even though Bug goes to school for the first two days this week. Because of this, I got up early, got dressed, and headed off as if I were going to work. Why? Because Miss Bug likes to argue with me about how she should stay home from school if I am staying home from work. 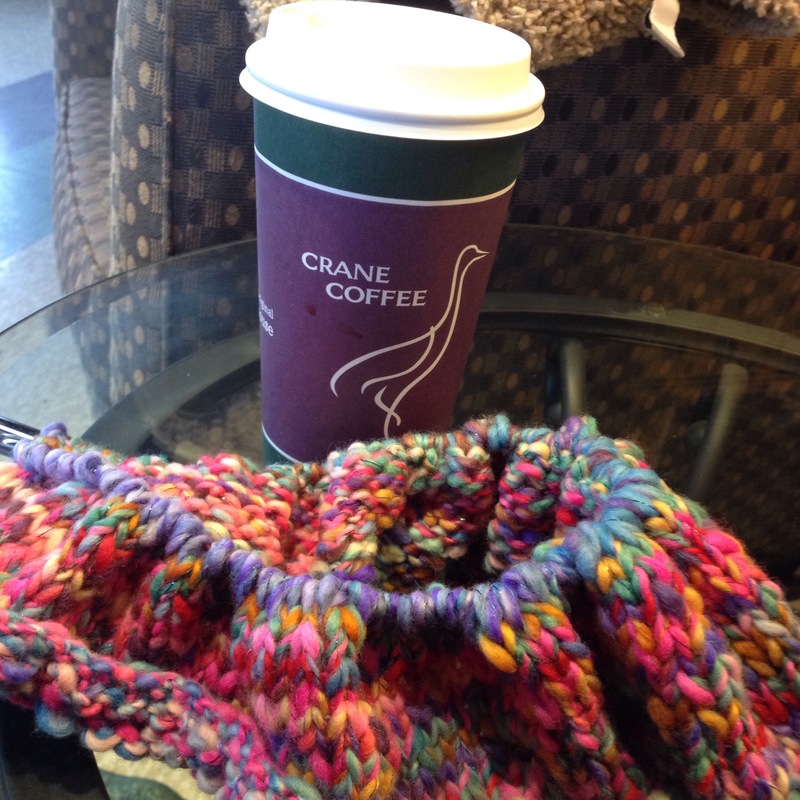 My morning started at a coffeeshop, knitting and drinking coffee and waiting for shops to open. I then went to half price books and goodwill to drop off stuff from my crazy basement, office depot for tape for gifts, and then I came home to make breakfast, start dinner, start washing fleece, and wrap as many gifts as I could find boxes for. 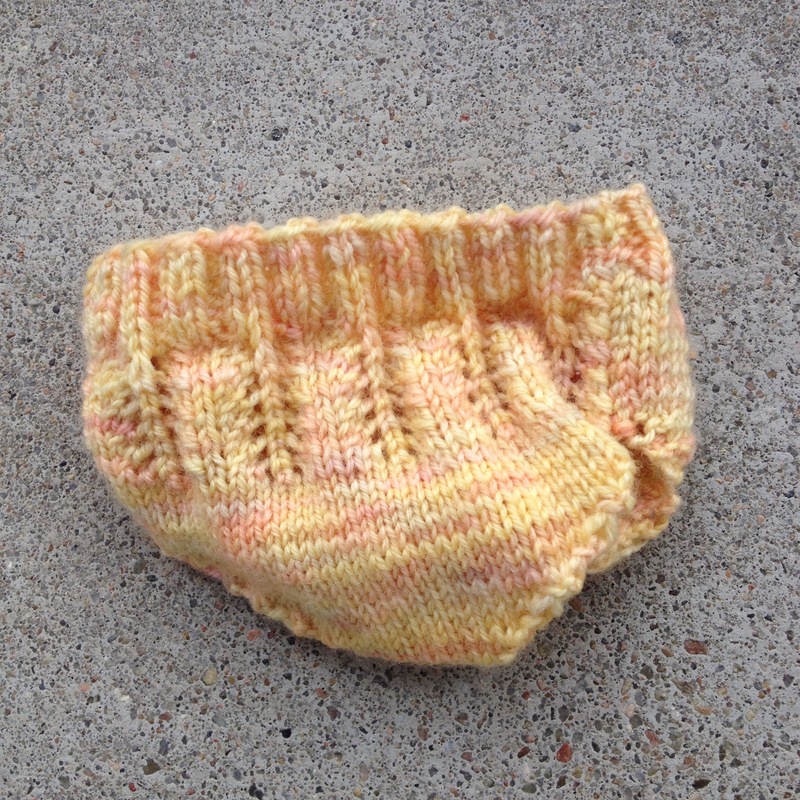 Speaking of gifts, I also had an opportunity to photograph a couple of the Julie knits. The first being a tiny pair of underwear for the doll. These were kind of a ridiculous endeavor but I think they’ll be appreciated even so. And they turned out pretty good. I didn’t bother to block them, it seemed a bit like overkill. Quite simple, and very pretty out of Blue Moon Fiber Arts socks that rock. 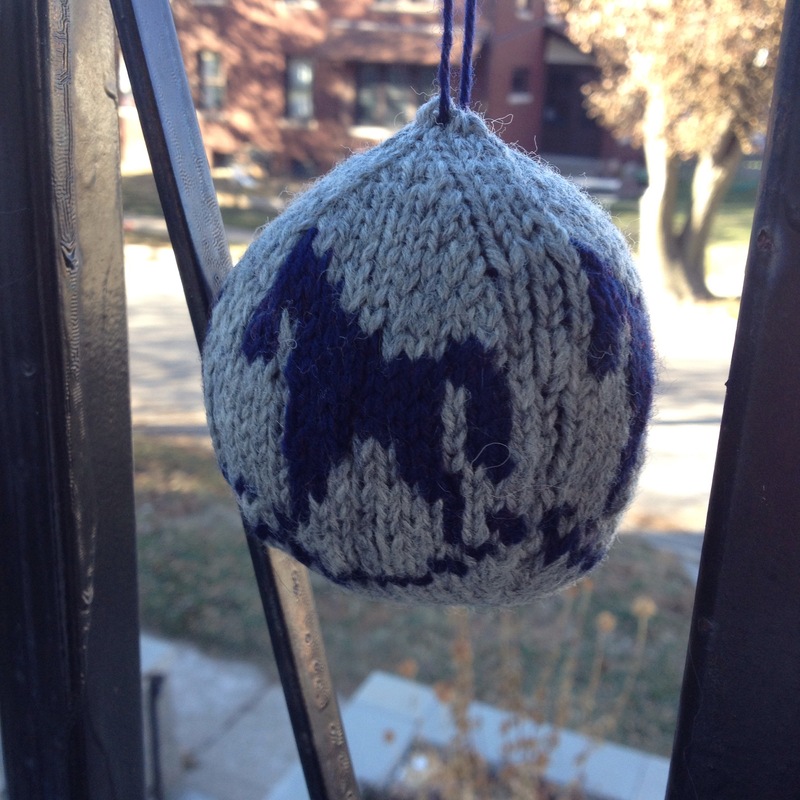 And finally, I made another christmas ornament. This one doesn’t have high contrast so it isn’t my favorite. I’ll try to remember not to pair these two colors again. I am working on another ornament when Bug is home, this one quite different from the others. But, it’s slow going as it is almost all colorwork, and I am using yarn that isn’t exactly fit for the job. 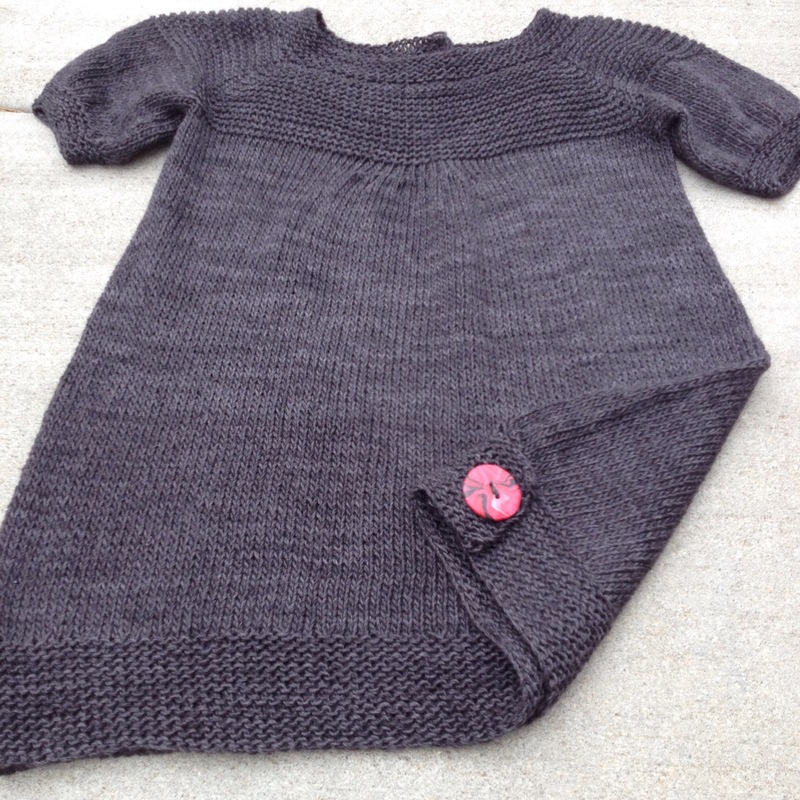 I am also almost done with Bug’s christmas tunic, which I hope to show off soon. That’s my knitting project for today since I can knit without her figuring out it’s hers. More tomorrow, for sure! 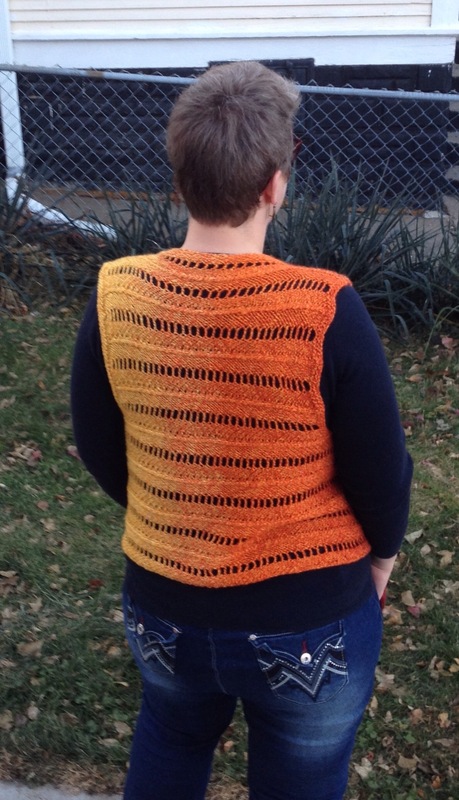 Including a gradient vest I finally completed!